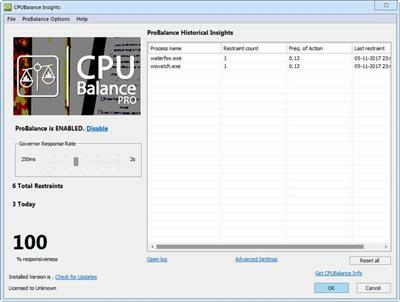 CPUBalance is a lightweight tool that uses the companys ProBalance technology to monitor and prevent running processes from hogging the processor, in order to improve the systems response time. This application can be run standalone or along with Process Lasso, enhancing its existing ProBalance feature. Monitor running processes to block CPU hogs Following a speedy installation that should not be difficult, CPUBalance gets integrated into the systray at startup, although it does not draw your attention. Also, it adds itself to the Windows autstart sequence to run automatically every time you turn on you computer. As soon as its fired up, the utility begins to keep an eye on your running processes, taking note of their activity, such as time of launch and process priority change. Clicking the tray icon brings up the main window, where you can view a list of all processes sorted by the restraint count. Furthermore, you can open the log to view extensive details about each action taken by CPUBalance, including the time, process name, action (e.g. ProBalance restraint ended, process priority temporarily lowered), more information, computer and user name, path, and command line. Filters can be applied if you are trying to locate a particular event. This log can be saved as a CSV file. All aspects considered, CPUBalance can become a reliable assistant for controlling the behavior of CPU-demanding processes, especially for users who frequently work with multiple applications at the same time. It ran smoothly on Windows 10 in our tests, and we are patiently waiting for a stable release of the product.